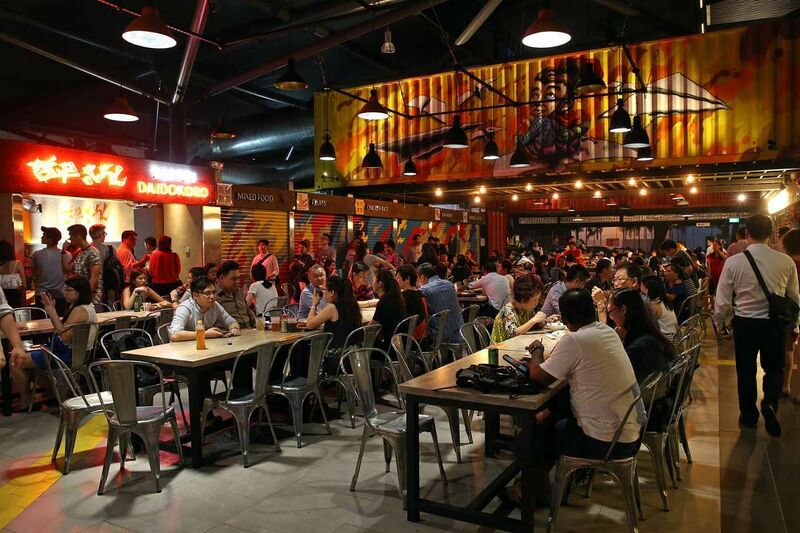 SINGAPORE - The newest hawker centre in the country might just be the first to have both traditional and hipster cuisine served in the same place. NTUC Foodfare said on Wednesday (Sept 6) that the eatery, to open in Pasir Ris Central in November, will "inject new energy to the local street food scene". Step into a futuristic world at the FoodTastic productive coffee shop in Choa Chu Kang Avenue 1, where there are robots at work, such as collecting trays and cleaning the floor. Robots including a tray trolley return robot and an automatic floor cleaning robot ply the aisles. Mr Ricky Kok, managing director of Chang Cheng Group which operates the coffee shop, said the smart technologies will bring customers greater convenience reduce manpower. The newly opened Yishun Park Hawker Centre, located opposite its namesake, brings some fun to mealtime, with a Games Square. There are pinball machines and arcade games available for patrons to play. Managed by Timbre Group on a not-for-profit basis, the eatery is the latest in a series of socially conscious hawker centres being developed by the National Environment Agency. At Timbre+ hawker centre in one-north, it pays to return your tray after eating. At the Timbre Group-run eatery, diners pay a $1 deposit for a tray tagged with radio frequency identification (RFID) when buying their food at a stall. After eating, they put their trays at a conveyor belt with an RFID reader which detects that a tray has been returned. Diners then get their $1 deposit back, as the tray heads to the washing station. While one may not normally associate coffee shops with being "atas", Salut Coffeeshop in Block 119, Bukit Merah Lane 1, has something to say about that. The eatery's tables have been jazzed up with blue-and-white checkered table cloth. Instead of what one would consider the typical hawker fare, it has stalls selling food you could imagine seeing in a restaurant, such as European cuisine. For example, one of the stalls called Stew Kuche sells authentic German pork knuckle and Swiss oxtail stew. Fancy!